Hot sweaty car seats in summer or icy cold seats in winter? 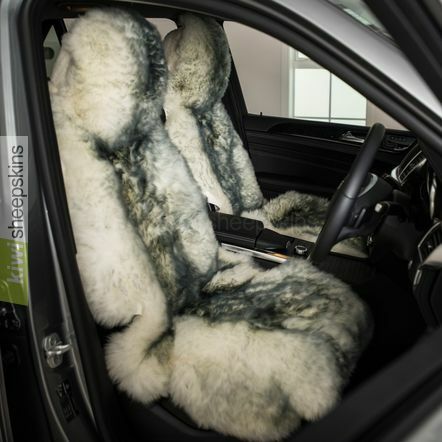 These New Zealand made sheepskin car seat covers can help! Sold singularly, order two and save, plus we'll aim for a matching pair. 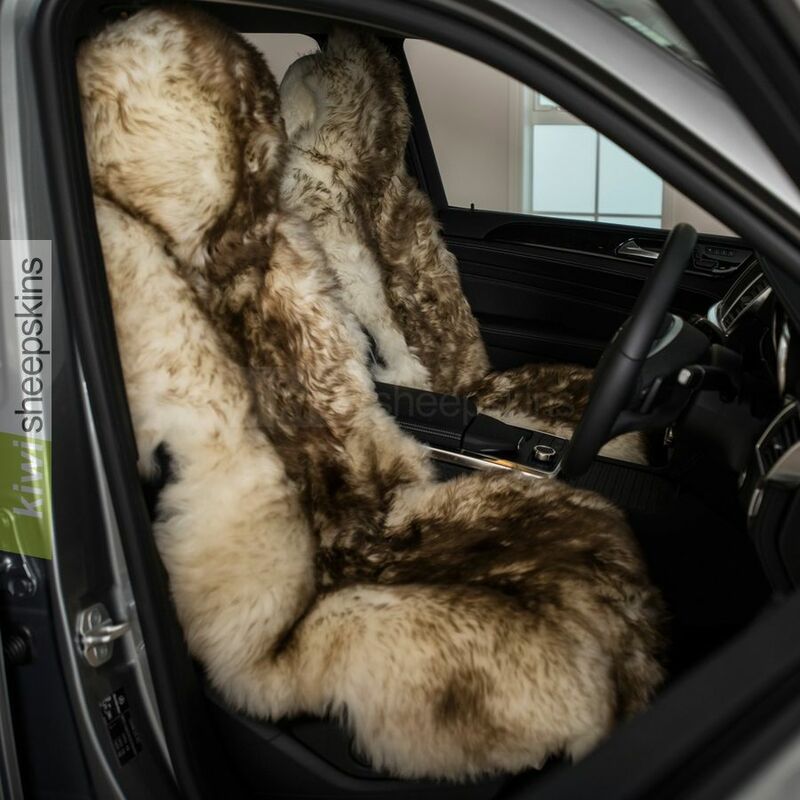 Hand crafted by Classic Sheepskins who have gained a wealth of experience manufacturing genuine sheepskin car seat covers for over 30 years. 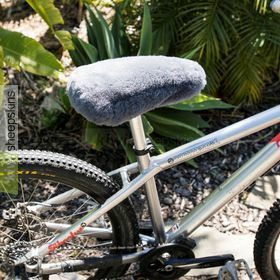 Premium quality unshorn (long wool) sheepskin seat cover - available in 7 colors. 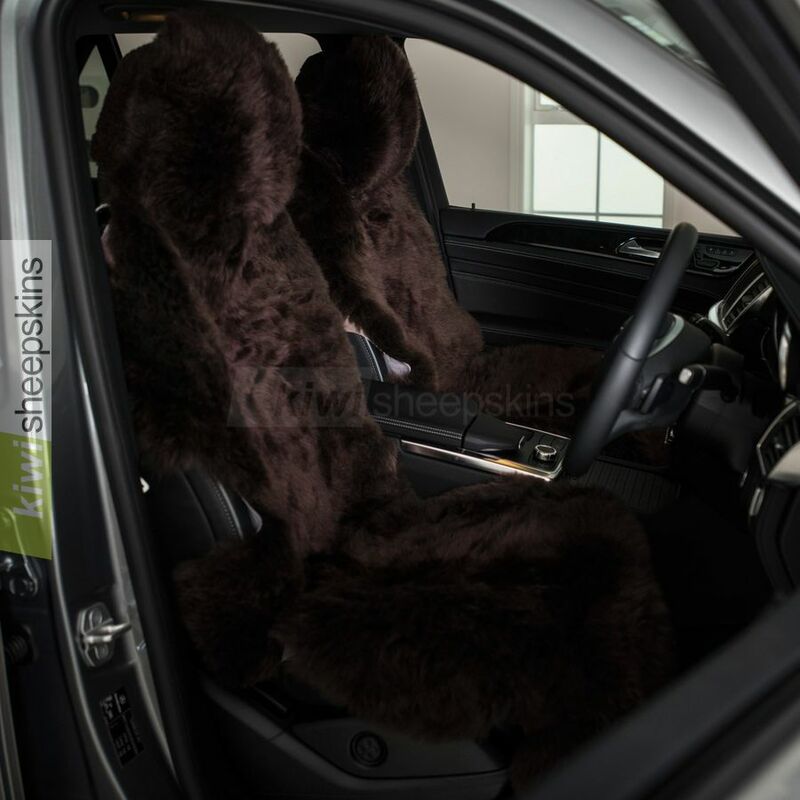 Made from two luxurious New Zealand lambskin pelts retaining their natural shape, with an elasticized "fun fur" back to the headrest area for easy fitting to most car seats. First ensure the headrest is in a low position then simply stretch the top over the headrest and feed the hook and loop fastener straps through and under the seat so thay they are hidden from view and join front straps. The elastic "fun fur" back pulls the cover to provide a secure and snug fit around the headrest. For the Brown Tip cover the "fun fur" is Honey colored, for Black it is Grey and for others it is the nearest color available (not an exact match). 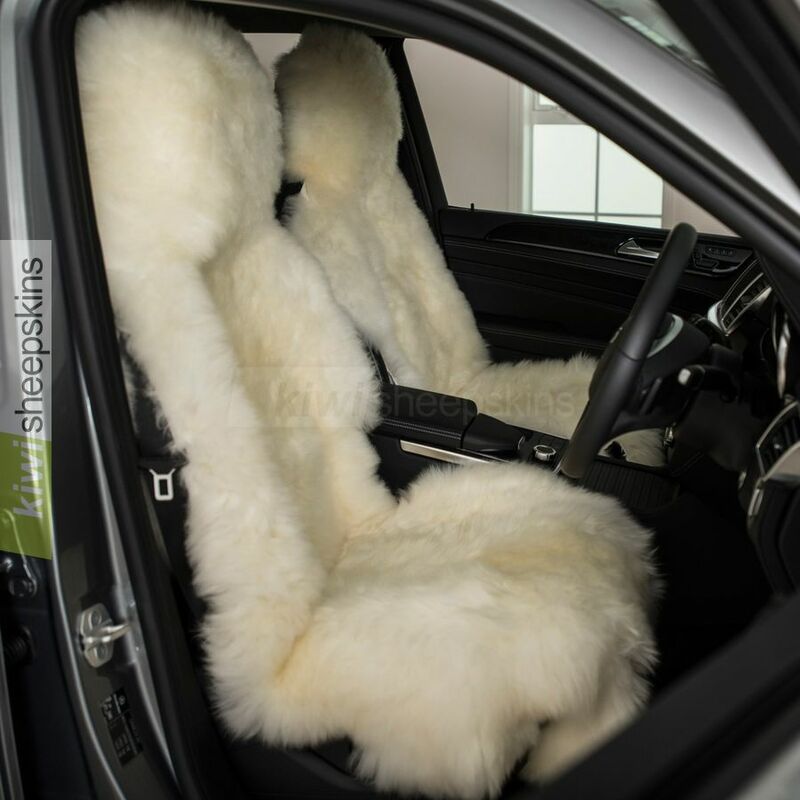 The sheepskin carseat cover covers just the front of the seat so that seat pockets on the rear of the seats are still accessible. IMPORTANT: If you have airbags that are built into the side of the actual seats, you may need to trim off excess width from the sheepskins. This can easily be done with sharp scissors. When passing the seat cover's straps under the seat, take care to avoid seat mechanism, wiring, etc. Lambskin car seat covers offer the ultimate in driving comfort. Wool, as a natural fiber, has unique properties that provide resilience and springiness to distribute pressure evenly over the body, allowing air circulation to help prevent the build-up of moisture. This results in coolness in summer and warmth in winter. As wool is capable of holding up to 33% of its own weight in moisture without feeling wet to the touch, perspiration is readily absorbed and is dissipated by natural evaporation. As we purchase these covers as a "universal" design, we aren't provided with details of particular vehicle models. However as they only fit the headrest and lay unfitted over the rest of the seat, they will fit most cars with headrests up to about 12 in. (30cm) wide. The length of the cover is approx. 56in. (142cm) which is measured from the top of the headrest, down the seat back and out to the very front of the seat. Covers in natural Ivory White color are normally kept in stock, all others are made to order so we can't cancel an order if work has started on your cover and exchanges/refunds aren't possible (unless defective). 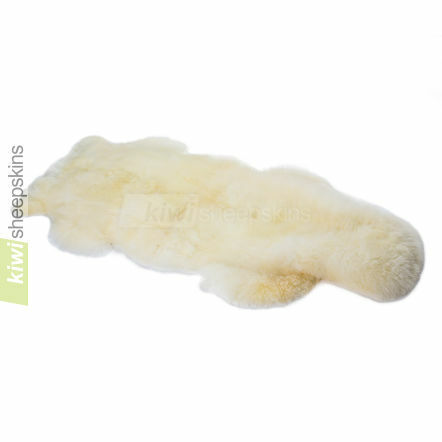 As the gentler tanning used to produce these long wool sheepskins doesn't have a strong bleaching action, the Ivory White color is closer to the natural color of sheep; it is a creamy white with some yellow to it. Due to the way the natural wool absorbs the dye, some tip-dyed sheepskins may have heavier, darker looking dyeing than others. Feedback from delighted customers who have purchased our long wool sheepskin seat covers. I want to take the time to comment on your long wool sheep skin seat covers. Shipping was very fast even though I had to pick these up from post office in person. These covers fit absolutely perfectly in my 2015 Mustang GT with the premium package and cream leather interior. I wanted something to protect the light colored seats and these fit the bill perfect. Installation was a breeze with a coat hanger. I ordered a special wool brush for wool rugs to keep them fluffy. Love the seat covers and thanks for the great product at very competitive prices without having to go to China. This is a superior product. 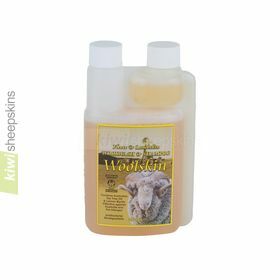 You will not go wrong if you buy products from the Kiwi Sheepskins website! I am very very pleased with my sheepskin car seat covers! They are absolutely gorgeous and luxurious! The pelts are of high quality! 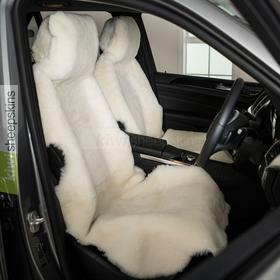 Even the elasticized "fun fur" back to the headrests is very nice! The Honey color matches my beige seats perfectly. As soon as they arrived I put them on my seats. Right now they're held on only by the elasticized headrests. I haven't fastened the seat straps yet. Because my seats are cloth, the sheepskin covers stay in place and do not move around. This is an excellent product, the prices are very reasonable, and they're made in New Zealand!!! The delivery was fast - arrived in 5 working days from day ordered. I can't wait for my friends and family to see and sit on these amazing sheepskin seat covers! I will be back to order the sheepskin boots next... I feel confident that they'll be just as amazing! Thank you Kiwi!!! I would just like to pass on my appreciation to your company for the great product that arrived at our place yesterday. The seat covers we got are awesome and we love them in our new car and will make traveling so much more enjoyable. The service and delivery was brilliant and super fast. Keep up the great work. Just want to send a huge THANK YOU for my beautiful sheepskin car seat cover [Grey Tip]. I absolutely LOVE it. I was worried it would not fit well, but it is perfect. Thank you once again for the beautiful car seat covers [Black], they are just the best, I rate them 10/10 100% beautiful, thank you again. I will be ordering from you again soon. The black sheepskin car seat cover arrived today, well in time for my son's birthday. Boy, doesn't it feel luxurious to the touch?! Just to let you know that the car seat covers [Black] arrived safely today, just 2 weeks since I ordered them. They are absolutely blissful, I wish I'd bought them ages ago. Thanks very much! Thank you very much indeed, I'm so pleased to have received my sheepskins [Brown Tip] and they look excellent in my car. I've already had heaps of comments on how good they look and hope you receive more orders for sheepskins from all us kiwis in oz. Thank you very much for the prompt delivery of the sheep skin seat covers. The quality of the seat covers & your service, has greatly exceeded my expectations. Again, thank you very much, & rest assured I'll not have any doubts in recommending your company with regards to your products & service to my many business, contacts, friends & relatives. Thank You! A very prompt turnaround on the order and my wife and I are very pleased with the quality of the seatcovers and rug that you sent. The product is well worth the price. (Doesn't mean that you have to go up on it though!) Looking forward to dealing with you again in the near future. Received the Long Wool Car Seat covers today. Very pleased with them & with your service. I will have no problem recommending your product & service. 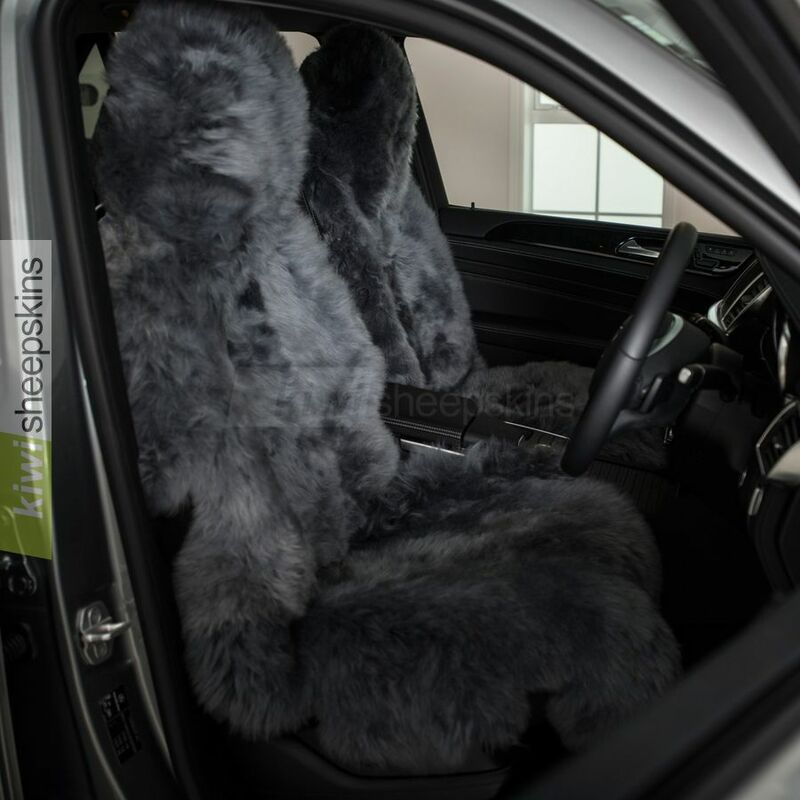 I already got my sheepskins (Grey-Tip Seat Covers)! You are so efficient! I purchased them online on April 27th and I received them on May 3rd - and my order was a special order item! I already have a friend that wants to buy from you. I will totally recommend your business whenever anyone asks me about my sheepskins! And yes, I am very happy with my purchase! As usual, I am most impressed by the quality of the car seat covers. My two grand-daughters are both drivers and already have one of your car seat covers each - last year's Xmas present. The additional two covers are for this Xmas. They are tickled pink with them as they are not only very comfortable but also look very stylish. Again, I am most appreciative of the very high quality of product and delivery of your products of which I have now purchased quite a number. I would like to take this opportunity to say how pleased I was with my grey seat covers. The quality is superb and the difference in comfort is frankly astonishing!! Only problem is my youngest daughter convinced me that black would look better in my M5 and that the grey is ideal for her Beetle Cabrio so she has nicked them (hence the second order!). I will soon be able to once again experience that wonderful luxurious feeling you get when slipping behind the wheel!! An excellent product. Seat covers arrived yesterday - 4 days from posting, not bad for this time of year!! Maybe NZ post had a little help from the fat man in red. Anyway they are fitted, well and truly sat upon and look great! Thank You. Received the seat covers Saturday and they are absolutely gorgeous. Many thanks. Thank you very much for the sheepskin car seat covers you sent. They are superb. It's been a few years since I have had a car with sheepskins. I don't know why I stopped, I am so glad I have them now. NZ sheepskins are always the best. Thanks again with my query that I had. They arrived when you said they would. Everything's perfect. I just received my order. Love ... love, my new seat covers!!! I will highly recommend your company to anyone that wants to order genuine sheepskin! Your company was great to work with.